At 4.30pm on Saturday – three hours before our game – my story for this week was almost complete. In my head, that is. The footy itself would be added later, almost as an afterthought, as the main focus was to be me attending a footy match alone. At a guess, I’ve been to perhaps 950 (or more) games over the past 69 years, and I can categorically state that I’ve never, ever, been to one on my own. Never. The thought, let alone the act, was daunting. This time last week, having missed going to Melbourne for our game against Hawthorn because of Marshall’s health issue, little did I know then that I would probably have to attend our game against Freo on my own. Or maybe, not at all. Tuesday morning arrived, and five hours later, after an angiogram, I was told Marshall wasn’t allowed home until stents had been inserted into his arteries later in the week. Four nights on my own! Friday came round, three stents were inserted, and by the time he was wheeled back into the ICU ward, slightly groggy and with large plastic clamps attached to his inner thigh and blood covering the sheets, my fears that there would be no footy (again) this weekend, for either of us, seemed pretty obvious. Big smiles all round. “You should be able to go home in a few hours, once the results of the blood tests come back”. “Will he be able to fly to Brisbane in a week’s time?” I ask, all too aware of our winter footy commitments, and my very real desire to be there. “I can’t see any reason why not”, is the reply. Must admit, mind you, that the thought had occurred to me that I could go, alone. I’d only be away for three hours, and they wouldn’t have discharged him if he wasn’t fit and healthy, were the intermittent thoughts. We drive, instead of our usual walk, to the SCG, park in the car park, and arrive in our O’Reilly Stand seats at three quarter time in the reserves game. Marshall at the footy, before the main game. Six hours later, we’re home again. Marshall is happy, I’m happy. We’re happy because he managed to get to the game, enjoy it – without any of the usual stress associated with close ones – and happy that his new stents will now give his arteries many more years. As I’ve mentioned in earlier stories, he’s convinced he’ll live to 100. And I’m really happy that I didn’t have to experience my first game alone! The game itself was almost secondary tonight. But it was a good win, a percentage booster, and the start, perhaps, of a more consistent four quarter effort from all players involved. But for Freo’s three posters and a couple of close misses in the early stages, the quarter time scores could well have been level, and but for the efforts of our backline – considering the number of entries into their forward half – a very different story could have been written. Freo’s only goal for the first half came in the second quarter, while our seven were spread between Will, Ronks, Joey (2), Lloydy, Heens and Buddy. After half time we continued to dominate, frequently repelling the opposition’s forward entries – lacking in polish most of the time – and adding a further four goals in the third quarter, from Paps, the new boy Tom McCartin – juggling a mark on the goal line – Joey for his third, and Buddy – his 300th for the Bloods. Sandilands added a mere goal to Freo’s score. The last quarter panned out more or less as expected. Often, a team who is trailing badly, will kick a few six-pointers when the pressure is off and they realise they can’t win, and Freo did just that – five of them, in a see-sawing goal fest for the last 30 minutes of the game. Fortunately we added six: Paps for his second, Sincs, Buddy for his third, Georgie, and Tom McCartin his second. A special mention must be made of Jarrad McVeigh. He is playing as well as ever this year, leading his troops in the back line, and any thoughts of him retiring this time last year have well and truly been put to rest. Long may he continue to dominate and give his all for his beloved Bloods. The same can be said of our other stalwart in defence, Nick Smith. Smithy is so underrated, and it’s a cliche, yes, but he’s the first picked week after week. He’s a real gem. And he deserves all the accolades in this, his 200th game. The guys in the back half racked up all the possessions this week, and I do wonder at times, how Lewis Melican, Nic Newman, Aliir Aliir, Harry Marsh, and Robbie Fox are going to make their way back into defence in the seniors. These reserves boys, together with Dan Robinson, Dean Towers (who were both dropped for this week’s game), James Rose, Colin O’Riordan, and our up and coming ruckman Darcy Cameron, will all, at some time, be considered good enough to play (or return) on the big stage. And that is what all teams need – a good crop of youngsters ready to pounce. The young ones currently mixing it with our regular more experienced stars, are certainly making their mark at the club. Ollie Florent was again impressive this week, Will Haywood continues to shine, Zac Jones is a beauty, Tom McCartin looks to have what it takes, and the star from Round 8, Ben Ronke, can obviously play! I doubt his stars and planets will ever align for him as they did last week, but he’s here to stay. To say nothing of Isaac Heeney, Callum Mills, George Hewitt and the bevy of younger, now permanent members of the side. A wonderful combination of Bloods players. As I finish this story, I’m reminded of the three different bed numbers that were allocated to Marshall in his five day stay at Prince of Wales hospital. They couldn’t have been chosen more aptly, considering the input of three of our young stars at the moment: Bed number 13 (Ollie Florent), then 9 (Will Hayward) and finally 10 (Zac Jones). Marshall hadn’t even noticed, but I, of course, did! Go the Mighty Bloods, and go Marshall! Just can’t believe that Marshall actually got to the game, Jan. I actually thought he’d be in hospital for at least three days after his stents. But not our Marsh!! And what a great win for you both. I did worry about you going by yourself, Jan, as you’ve never been to one alone. Well, not worry in that you’d get lost! Just a big change for you. All turned out well, and may Marshall live to 100!! Marshall to live to 200?!!! I don’t believe a word of it. I reckon that photo of Marshall at the game was taken ages ago. 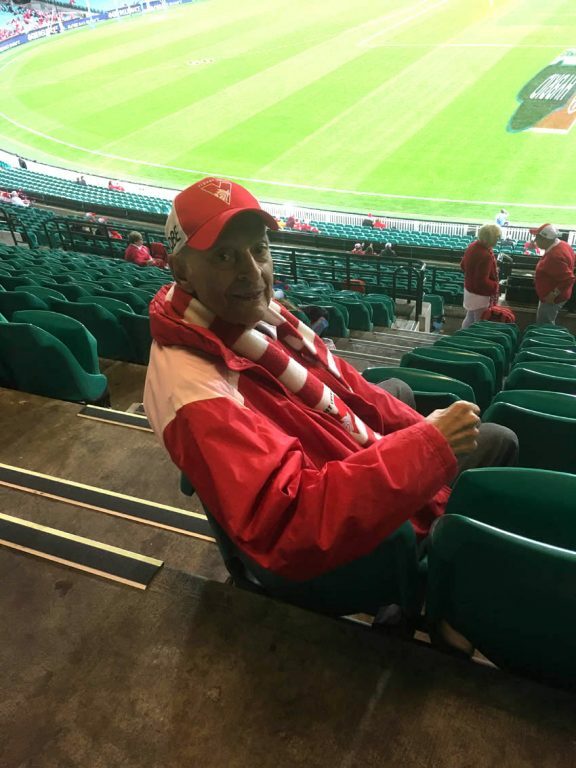 There’s no way a man approaching his 90th birthday could go to the footy (including the reserves match) less than 24 hours after have three stents inserted into the main arteries of his heart!! Get real Jan Courtin – this has to be one of your fictional short stories! Thanks one and all. He might be in this 9th decade, Jude, but only 86!! Fantastic Jan! Great to see Marshall not only out of hospital but at the footy! It was a pretty ordinary game from my viewing on tv, though you can’t knock a 10 goal win. The young ones show something each week. I’m really impressed with Ollie over recent weeks. Like you I’d like to see some of those reserves getting their chance, though time will tell. Hope to catch up in Brisbane next week. Still planning on our trip to Brissie. Will text once at the ground. Or you text me where you’re sitting.